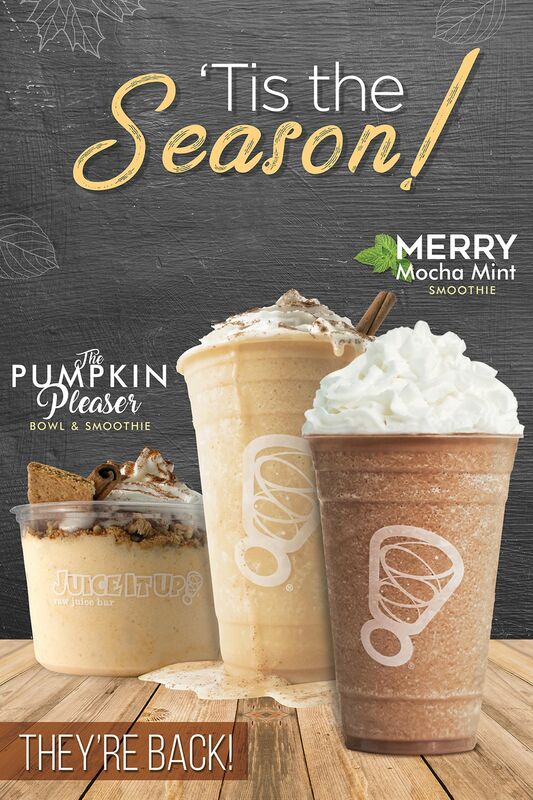 Irvine, CA (RestaurantNews.com) Juice It Up!, one of the nation’s leading raw juice bar and hand-crafted smoothie chains, joyfully announces the return of its all-time seasonal guest favorites, the Merry Mocha Mint Smoothie™, the Pumpkin Pleaser Smoothie™, and its heartier counterpart, the Pumpkin Pleaser Smoothie Bowl™. Back by popular demand, these signature smoothies are decadent, creamy, and a healthier way to indulge in the flavors of the season. Available in three sizes, Juice it Up!’s Pumpkin Pleaser and Merry Mocha Mint Smoothies were designed to be delicious, yet extremely functional to help fuel guests’ busy, active lifestyles. Both are an excellent source of calcium, vitamin D, fiber and iron, and are low in cholesterol and saturated fat. Looking for a meal replacement that won’t leave you feeling naughty about your decision? Then the protein-packed Pumpkin Pleaser Smoothie Bowl, topped with organic granola, graham cracker crumbs, whipped cream, cinnamon and graham cracker sticks, is for you! Check out “What’s New” on the Juice It Up! website to stay updated on special offers and juicy promotions. Follow Juice It Up! on Facebook, Twitter and Instagram for the latest promotions and coupons, and join Juice It Up!’s Smooth e-Club rewards program in-store or online for weekly specials and exclusive offers. For the full menu, complete nutritional information and to find your nearest Juice It Up!, visit www.juiceitup.com. Juice It Up!, a leading raw juice bar and hand-crafted smoothie franchise, specializes in delicious and functional fresh-squeezed juices, blended-to-order real fruit smoothies and nutrient-rich options such as Açaí and Pitaya Bowls. Founded in 1995, the Irvine, California-based lifestyle brand is focused on providing its guests with a variety of great-tasting, better-for-you food and drink choices designed with personal wellness in mind. With over 100 locations open or under development across California, Florida, New Mexico, Oregon, and Texas, the privately-owned company is showcasing a new restaurant design, a heavier focus on the growing demand for raw juice options and a menu refresh that reflects the brand’s active personality and motto to “Live Life Juiced!” An established lifestyle brand with unparalleled experience in the raw juice bar industry, Juice It Up! has been included in Fast Casual’s 2017 Top 100 Movers & Shakers List, Franchise Times’ 2017 Top 200+ Franchise Chains, named a 2017 “Best for Vets” Franchise by Military Times, ranked in Entrepreneur Magazine’s 2017 Annual Franchise 500® List, and named one of Entrepreneur Magazine’s 2017 Best Food Franchises and Top Franchises for Veterans. For more information about becoming a Juice It Up! franchise partner, visit www.juiceitupfranchise.com.